I wanted to thank everyone who thought of us and prayed for us about the babysitter situation for Tristan. We were able to secure a spot for him with a day care provider (in home) on base. He starts Monday. :) I'm trying SO hard not to feel nervous and stressed. It's hard leaving your baby with someone you don't know. I want to be there with him every second of the day and I just can't. This week he is staying with my friend and he seems to be doing fine. It's only been one day though. Hopefully today goes well too. I'm keeping my fingers crossed!! So I'm looking for a sugar free iced coffee that I can drink - that actually tastes good. I like the Iced Caramel Coffee from McDonalds and I LOVE Caramel Fraps from Starbucks. But, they are loaded with sugar. 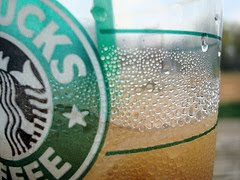 I tried a Skinny Iced Vanilla Latte this morning and it was OK. (From Starbucks). It's not as sweet as I'd like, so I had to put some splenda in it. I could probably handle it but I'd like to have something that tastes a little better. Any suggestions?! Contact Direct TV and see if we can cancel our service. IF NOT, have it moved to the new house. She couldn't watch Tristan anymore :( Very stressful time but I'm getting thru it! !